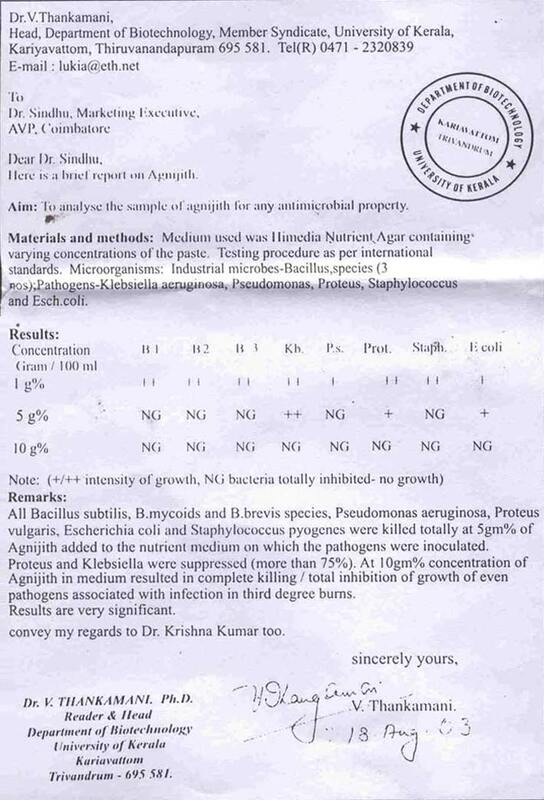 According to an in vitro study conducted by the Department of Biotechnology, University of Kerala, Thiruvananthapuram India, Agnijith has been found effective in total inhibition of growth of pathogens, even the ones associated with third degree burns. In every modern medicine, there is an exact formula of its ingredients. In a thinking society, people would require reasoning for everything. Burns are of 3 degrees. First degree, second degree and third degree burns. This classification is based on the severity of the burns – how deep has the burn affected the body. Third degree burns are the most serious – it will be deeper, have high temperatures, lot of protein and fluid loss and the patient goes into a shock. Blood pressure will be lowered; kidneys and heart will get affected. And more severe than this is the infection. Normally, burn deaths happen due to bacterial infections. I myself have witnessed many serious burn cases being treated at Padanjali – no blood replacement, no plasma replacement, no antibiotics; and without all these, the patients get perfectly cured. I was wonder-struck and really curious. So I brought a sample of the medicine into my lab, for scientific testing. We applied our standard testing procedures. We know that an infection is caused by bacteria. Highly powerful toxins are produced by bacteria like pseudomonas. A medium with them would seem poisonous to even laymen, due the colour, appearance etc. Voice over: A modern society need to be properly convinced about whichever treatment system that is being applied. This is nutrient agar. It has the medium, i.e. all the food materials and environment required for bacteria to grow. In this we inoculate dangerous micro organisms like Pseudomonas, Staphylococcus, Proteus, E. coli, Klebsiella etc. 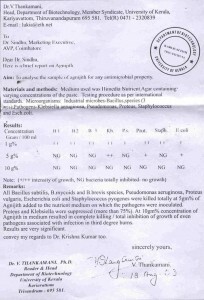 Into this, we applied a very small percentage of Agnijith and we can see that only 2 bacteria i.e. Pseudomonas and Proteus have grown. Others like Staphylococcus, Klebsiella etc are completely or partially inhibited. Next, is the same medium with same types of microbs inoculated and we have 5% Agnijith applied. We can see that none of the organisms are growing. All of them have been completely inhibited. Similar is the case of fungus. We have a special medium for fungus. It has high glucose content, low pH etc. Here, we have inoculated most common fungi like Aspergillus, Candida, Penicillium etc. At 5-10%, Agnijith has inhibited all of them completely.